The goal of this guide is to provide a synopsis of my recommended builds and strategies with an emphasis on group support, not DPS. An in-depth explanation of the fight and its mechanics can be found here. Samarog is a simple fight as long as your squad understands mechanics and has enough CC & DPS. Druid really shines on this fight because of its vast arsenal of CC abilities and other skills. The most common reasons for failure are insufficient CC during Samarog’s Brutalize attack and poor control during Rigon and Guldhem phases. Mursaat Overseer is largely regarded as a DPS golem, and your main job is to keep up might stacks so everybody can maximize their DPS. Druids can take any of the special actions, but I usually find myself dispelling or protecting. Cairn is a boss fight that is entirely dependent on mechanics. Players that fail mechanics will get into downstate quickly, and Cairn wins by chain-downing players with shared agony and shards as they attempt to rez their friends. Your role as druid is to keep your squad topped off as best you can. Pet rezzing via the Allies’ Aid trait, “Search & Rescue!”, and Spirit of Nature are all excellent ways to help your team recover from failed mechanics. You also have Sublime Conversion (staff 5) to help protect yourself and others from shards while rezzing. Druids are typically tasked with healing shared agony but may be asked to kite, as well. Druid has been the meta raid healer for a while now due to its strong heals and insane boon support. While druids remain nearly essential because of their might-stacking ability and large number of class-specific buffs, it’s not essential to have two. In fact, with recent nerfs to druid healing, the improved sustain that a tempest auramancer brings may be the perfect complement to the druid. Tempest healing feels more like a traditional healer when compared to druid, which appeals to a lot of people. The sustain is real with tempest, too. Passive healing produced by Soothing Mist and regeneration keep the team topped-off through light and moderate damage, and you have an impressive assortment of water fields and blast finishers that can be used when burst healing is required. With so much at your disposal, it can be tricky to know what to use and how to be most effective. I’ve compiled this guide to help get you started. It covers your basic healing toolkit and touches on some less-obvious, advanced usage relating to dodging and attunement swapping. Your bread & butter healing comes while attuned to water. You pump out Soothing Mist to allies, you can overload for a big area heal, and every weapon skill can provide healing. I typically use Ice Spike off-cooldown as long as Geyser, Frozen Ground, or Healing Rain is available to thrown down as a blastable field. Soothing Mist and regeneration tick for a lot of healing and, when combined, provide very strong group sustain. Soothing Mist This is a passive, class-specific regen that’s applied to allies whenever you’re attuned to water. Its effectiveness is doubled with the trait Soothing Power. Water Blast Water auto-attack that heals allies. Face camera down and cast with no target to heal the area around you. Geyser A powerful small-area heal and a water field that can be blasted for additional area healing. Geyser also revives downed players. Frozen Ground An ice field that can be blasted to apply frost aura, which grants regen when traited with Invigorating Torrents. Healing Rain A large-area regen that also clears condis and another water field that can be blasted. Clear even more condis when the Cleansing Water is selected. Overload Water Arguably your strongest healing skill. Heals for a large amount, applies regen, and removes condis. Evasive Arcana Cast Cleansing Wave when dodging while attuned to water, which heals and removes 1 condition from nearby allies. Water Attunement gives you a lot of tools for healing, but there’s a whole host of other skills that also provide healing. In my utility slots, I typically run two shouts for healing-via-auras and choose the third based on the fight. The following skills can be used for more healing. My default setup uses Feel the Burn and Flash-Freeze because they have lower cooldowns than Aftershock, but it’s worth noting that Aftershock has higher burst-healing potential due to the fact that it’s a blast finisher. Wash Away the Pain A powerful group heal. Other healing slot skills only heal yourself, making this a no-brainer. Feel the Burn Grants fire aura to allies; heals and applies regeneration when traited with Invigorating Torrents and Elemental Bastion. Flash-Freeze Grants frost aura to allies which provides damage mitigation; heals and applies regeneration when traited with Invigorating Torrents and Elemental Bastion. Aftershock Grants magnetic aura that reflects projectiles to allies; heals and applies regeneration when traited with Invigorating Torrents and Elemental Bastion. It’s also a blast finisher. Signet of Water A low-cooldown targeted AOE heal. It also revives for a small percentage. Rebound Prevents a killing blow and heals instead or applies an aura based on your attunement. It’s generally used when you see that somebody’s about to die or you know there’s a damage spike on its way. These skills should be used situationally. My default is Lightning Flash for mobility unless CC is needed, in which case I favor Conjure Frost Bow. Conjure Frost Bow Deep Freeze (skill #5) is a strong CC. Eye of the Storm A group stun break. Glyph of Storms Use while attuned to earth for an AOE blind. My default build can be viewed here, but I do swap some traits as-needed depending on the fight. It’s easy and tempting to sit in water attunement and heal, but you give up a lot by doing so. By camping water, you’re basically forfeiting benefits provided by traits like Healing Ripple, Cleansing Wave, and Elemental Attunement. You’re also missing out on blast finishers that can be used to chain together huge burst-heal combos. For example, the water field left by Healing Rain lasts long enough to attune to earth and blast it with Eruption. For a quicker blast, you can simply dodge while attuned to earth thanks to Evasive Arcana. Don’t forget to help out during CC phases there, Mr. Healer. You’ve got a few tools at your disposal. The number shown in parentheses below is how much defiance bar damage the skill does. Your most reliable CC comes from Deep Freeze and Gust. Static Field and Unsteady Ground provide decent punch but can be difficult to land, as they require the target to move into the ability to trigger it. Glyph of Empowerment, for Healing! Empowerment is only brought if you have power classes, the most important of those being weaver. For example, if you only have 1 holo in your sub, empowerment is not as important and another utility can be brought for mechanics or whatever. I disagree with this point. Using Glyph of Empowerment offensively might only be relevant for power classes, but the healing output it provides when used while in Celestial Avatar form is substantial. I find the skill is rarely not useful since you can use it for a) power DPS boost, b) healing increase, and/or c) small heals & condi cleanse when traited. In the past, I’ve mostly only used it off-cooldown while not in CA. With the recent balance patch nerfs to druid healing, though, I’ve been using it more in situations that require fast, powerful heals. Gorseval’s tantrum is a good example; CA → Glyph of Empowerment → Rejuvenating Tides was enough to keep everybody pretty well topped off. Timing it with Quick Draw allows for an extended duration of potent heals with the Rejuvenating Tides/Lunar Impact/Rejuvenating Tides (4-3-4) combo. In addition to using it when you enter CA, you can also use it just before exiting CA. This allows you to improve regens applied by warhorn #5 or quick burst healing with staff #3 or staff #5→#3 combo. If you don’t need that extra healing, sure–use it off-cooldown out of CA or bring something else that’s more useful, but don’t forget about this incredible skill as part of your healing toolkit! Ever since the druid trait Gift of the Land was improved to affect 10 targets, druids have been the preferred healer for raids. Even without the healing, druid buff support is insane with 3 class-specific buffs (Spotter, Sun Spirit, Frost Spirit) plus the ability to stack 25 might on the full squad with perma-regen, perma-swiftness, and perma-fury. On top of that, druids can also out-DPS other healing classes, routinely doing 3-6k where other healers struggle to hit 1k. This guide is intended for experienced and inexperienced druids alike. It represents my opinions of what druids need to know and do to be effective and hints at some advanced usage. I’m always looking to improve my own knowledge and gameplay, so please feel encouraged to leave comments about anything I’ve missed, gotten wrong, or may not have considered. Before the most recent balance patch, I was running full harrier’s with no sigil of concentration, but because of the recent healing nerfs I’ve made some adjustments. My current build uses harrier’s armor, weapons, & backpack but magi’s trinkets with runes of the monk. For sigils, I have transference/water on my staff and transference/concentration on axe/warhorn. This build gives 67% boon duration, and the concentration proc puts me close to 100%. The rotation focuses on timing weapon swaps and entering/exiting Celestial Avatar (CA) so as to proc sigil of concentration and quick draw as much as possible. Trait lines are skirmishing, nature magic, and druid. You can view the build here. Most of the time, if you’re the only druid, you’ll run Sun Spirit and Frost Spirit. I find that more times than not, I’ll have Glyph of Empowerment in the final utility slot. 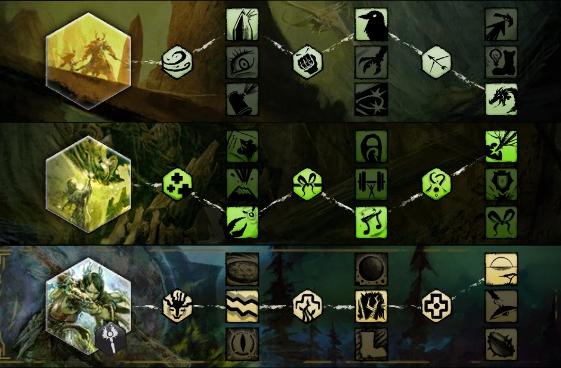 Glyph of Rejuvenation is my preferred heal skill due to its short cooldown, and my elite rotates between Entangle, Spirit of Nature, and Glyph of Unity. The tables below list other choices and considerations to be made when choosing them. There are two primary choices for healing skill: Glyph of Rejuvenation and Healing Spring. Healing Spring is the preferred option when condi cleanse is needed. Water Spirit can also be used as a passive group heal if burst healing is not needed. Glyph of Rejuvenation 19s-cooldown AOE heal plus casts Lesser Seed of Life, an additional small heal that also cleanses 1 condi. When used out of CA, it’s a powerful self heal and weak group heal. In CA, it’s a powerful group heal and weak self heal. Use the trait Verdant Etching when selecting this option. Healing Spring 24s-cooldown AOE heal that also applies regen and cleanses 2 condis. Use the trait Trapper’s Expertise when selecting this option. Frost Spirit Grants 5% bonus damage on hit plus provides might when traited with Nature’s Vengeance. Use Frost Spirit over Sun Spirit if you can only bring one and your group favors power damage. Sun Spirit Inflicts burning on hit plus provides vigor when traited with Nature’s Vengeance. Use Sun Spirit over Frost Spirit if you can only bring one and your group favors condition damage. Your remaining utility skill slots can be filled situationally or by preference. Stone Spirit A good “other spirit” option when there are two druids splitting spirit duty. Applies protection to the group to improve survivability. Great for training raids and also provides a group immobilize when sacrificed (Quicksand). Glyph of Empowerment Typically used as another class-specific buff for power damage (10% increase), but it also improves outgoing healing by 25% when used from CA. Additionally, it casts Lesser Seed of Life for a small heal and 1 condi removal when traited wth Verdant Etching. Glyph of Tides A good knockback utility that also casts Lesser Seed of Life for a small heal and 1 condi removal when traited wth Verdant Etching. This is a group pull when used from CA, but its range is quite small (300). 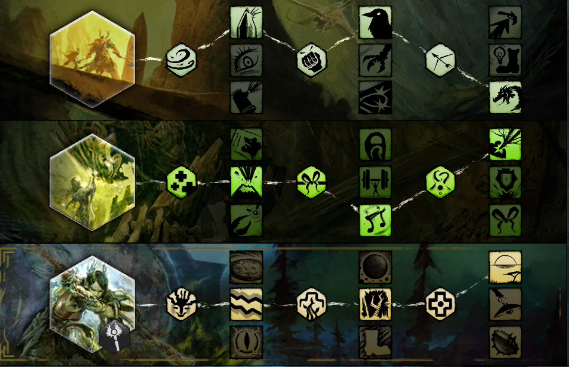 Glyph of Equality A daze that can be used for additional CC when other skills are not needed, but also casts Lesser Seed of Life for a small heal and 1 condi removal when traited wth Verdant Etching. Acts as a group stun break when used from CA. Storm Spirit Applies vulnerability on hit and provides swiftness when traited with Nature’s Vengeance. Storm Spirit can also be another source of CC when sacrificed (Call Lightning). Protect Me A group stun break. Search and Resuce A vacuum revive. This is only good when your group is learning and is experiencing frequent deaths. The elite skill is mostly situational. Entangle Use Entangle when immobilize is needed. Spirit of Nature Use Spirit of Nature when stability is needed but can also be used for group/pull revives. Be sure to use the trait Nature’s Vengeance. This is a good default option for PUGs that die a lot or when learning. Glyph of Unity Additional group healing when used from CA plus casts Lesser Seed of Life for condi cleanse. This is my preferred default skill outside the scenarios outlined for the other options. Ah, the heal skills. This is (mostly) what it’s all about. Druid provides some passive healing through regen, staff #2, and glyphs (seeds of life), but its healing skills are generally more bursty in nature than, say, a tempest auramancer. By constantly quick-drawing warhorn #5 in this rotation, you should achieve close to 100% regen uptime, and I generally keep this rotation going regardless of whether or not the heals are needed in order to keep might stacked on the group. You’ve got a few big heals at your disposal, but these should only be used when needed and not as part of your rotation or off-cooldown. The first and easiest one is your healing skill, Glyph of Rejuvenation. It’s a fast, powerful group heal that also leaves a seed of life that will pop for a 2nd, follow-up heal after a couple seconds. The next obvious big heal comes when in CA, primarly skills #3 and #4. If you’re quick-drawing into CA, you can do 4-3-4 for a relatively long duration of sustained strong healing. 3-4-3 is also quite potent but executes twice as quickly. #3 is targeted, though, so quick-drawing #3 is ideal for fast heals from afar. It’s hard to “save” these since you’re in and out of CA as part of the normal might-stacking rotation, but if big heals are needed, this is your bread & butter. The druid’s final source of big heals comes from its water field, staff #5. There are lots of ways to use it effectively, and it largely depends on where you’re at in your rotation, what’s available, and what’s needed. Be aware that you need to be careful with placement of the field so you can blast it, though. If you put your water field on another field and blast it, you’ll be blasting the other field i.e. no healing. Here are a few examples of how to use this field situationally depending on what’s available. You’ll also need to make a quick determination about how much healing is needed. Don’t blow everything to execute a full combo if a single blast is enough to get everybody to full health. Much like the water field from staff #5, you need to be careful with seed or life placement in order to be able to blast the light fields. Without worrying about placement, the lesser seeds of life from glyphs and seed of life from CA #2 offer a decent amount of cleanse on their own, though. In fact, it’s enough for most fights without requiring additional thought or specific, deliberate action. 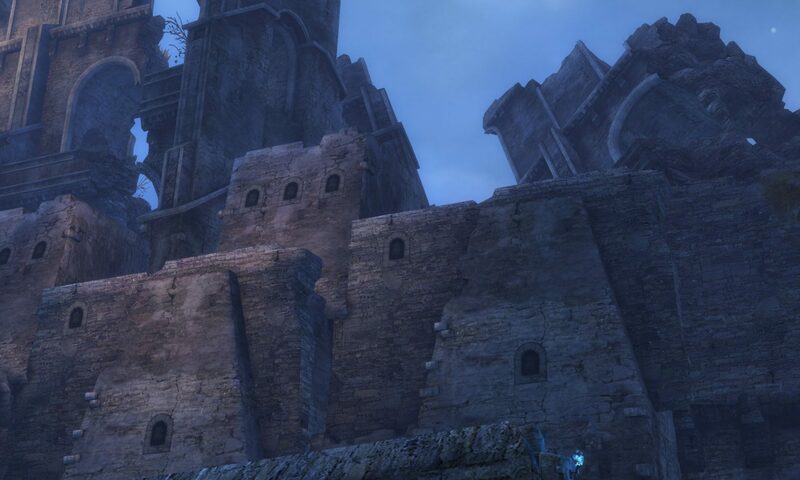 Lots of bosses have defiance bars that need to be broken quickly to prevent bad things from happening. Druids have lots of ways to pitch in! The easiest and most obvious is through your pets. I almost always have electric wyvern in one of my pet slots, and if a group’s having problems with break-bars, I’ll throw a rock gazelle into the 2nd slot. CA #5 is great for helping with breakbars as is CA #3. So, a particularly strong combo is to enter CA, quick draw #5, then #3, then #5 again. You can cast your pet ability while this is happening, too, for a large amount of CC. My default pair of pets is currently iboga for DPS–and another immobilize–and electric wyvern for CC. Replace iboga with tiger to generate a ridiculous amount of fury (use ability off cooldown) or rock gazelle if more CC is needed. Druid healing took a decent hit with this balance patch! Cosmic Ray: Reduced the healing of this skill by 30%. Seed of Life: Reduced the healing of this skill by 35%. Lunar Impact: The heal scaling of this skill is no longer split between game modes and will now use the lower 20% reduced heal scaling in all modes. Rejuvenating Tides: Reduced the healing of this skill by 40%. Windborne Notes: Reduced the duration of Call of the Wild’s regeneration from 10 seconds to 6 seconds. Verdant Etching: Reduced the healing of this trait by 35%. Overall, I think this is good for the game because making druids less effective will make other healer options more attractive (less unattractive? ), but it still makes me a little sad as a druid healer. I’ve been running a full harrier build for as long as I can remember, and I’m going to make a couple adjustments to make up for the reduction in healing. First, I’m going to swap all my trinkets from harrier’s to magi’s. Armor, weapons, and backpack will remain harrier’s. And, to make up for the lost boon duration, I’m going to swap the sigil on my warhorn from water to concentration. These two changes will increase my healing power by about 160 without losing boon duration, but I’ll need to pay closer attention to weapon swaps and entering/leaving CA to make sure I’m proccing the sigil correctly. The new build can be found here.